Following the fallout from the Baker Small affair, North Yorkshire County Council revealed it has started using barristers for legal representation at the SEND Tribunal. So far the Council has used one barrister, Joanne Astbury, from Park Lane Plowmen Chambers in Leeds for a one off fee of £3300. This was last September (2015) while it still had a contract for representation from Baker Small. It is not known why the Council opted to use a barrister over Baker Small. However, the Council continues to use Baker Small - it has a contract that runs until September. Payments are detailed on the Open Data page of the council's website. The council contracts with a firm of solicitors that provides legal advice to local authorities on SEN appeals and tribunals. The solicitors represent the council at Special Educational Needs Tribunals for appeals that are for out of area placements or 'complex' appeals (ie placements that will potentially cost the council money because it cannot provide appropriate education within the authority). It has calculated savings can be made to the council's SEN budget by adopting this approach, believing representation will increase its chance of winning some of these appeals (see here). It has given a number of other reasons for using legal representation but these have all been refuted by the Ministry of Justice (see this post). The Tribunal system is supposedly informal and parents are advised by the Tribunal itself that they do not need representation. This can lead to situations whereby the local authority is legally represented out of the public purse and parents are not. There is no public funding available for parents to be legally represented at Tribunal. Use the search term Baker Small when searching the open data links. The Council responded by saying, in effect, what it wrote was not quite what it meant, and that of course, parents could still opt for a statutory assessment if they so wished. So how many statutory assessments were carried out since NYCC announced its move? There were none from April to mid June and post-April the Council was giving notably evasive answers about statutory assessments (see here at 27 May letter). We don't have the data up to September. That in itself is suggestive, not conclusive of an absolute policy change, but this blog was also given first hand information from two unconnected senior teaching professionals who were both told by officials that all assessments post-April were to be EHC needs assessments only. Evidence exists if the DfE cares to dig. It is interesting to note that the blog ends with a DfE quote, 'new legislation which was, in part, created to "..minimise the adversarial nature of the system for families and to maximise value for money.' I am fairly certain that we are not the ones creating an adversarial system. We are not the ones creating an adversarial system. 1"A greater focus on gatekeeping"
In January 2014 the local authority announced its intention to place "a greater focus on gatekeeping" EHCPs and statements (Appendix 4 of page 75 here). It re-organised its decision making process so that a reduced number of senior staff make decisions about assessments, using the CAN-Do resource allocation system (RAS). This comes on top of a past declaration of "intensive 'gatekeeping'" by the authority in February 2010 (2) and an announcement to "tighten the processes of prescribing entitlement to statements"(4) in March 2012. The law is very clear, and the legal threshold has not changed for many years. A child must have each and every special educational need met. The responsibility for this lies with the council, so talk of 'gatekeeping', 'containing' and 'tightening' outside of The C&FA, The Education Act and SEN Code of Practice is extremely dubious. North Yorkshire developed the Comprehensive Assessment of Need Tool for Education; Resource and Support Planning for Schools (CAN-Do) during the SEN Pathfinder programme. It is an RAS to be used as part of, or entirely for, the assessment for an EHCP. Feed in a description of the child and it spits out an indicative budget for the cost of provision. Contained within the RAS is the revised assessment criteria. The council has plans to commercialise the system to sell to others. And for that reason it has refused to publish the RAS or the revised assessment criteria (see here). It makes professionals who complete the RAS sign a gagging clause (see here). The council currently assesses a child using a secret criteria and will not allow parents or the wider public to know what those criteria are, which makes the indicative budget or provision allocated somewhat hard to challenge, and runs counter to natural justice. 'The requirement for schools to meet the first £10k of provision could have a 'dampening effect' on the demand for statements (EHCPs). '(Appendix 4, page 75 here). The Council did nothing to mitigate the potential risk that children who would otherwise have a statement will not receive one due to the reluctance of schools to apply due to new funding changes. In fact, it positively welcomed the move. North Yorkshire has taken an additional step to make a school think twice before applying for or supporting an EHCP, or find reasons not to accept a a pupil with an EHCP on the school role in the first instance. For a school with more children with EHCPs than the 'notional number' allocated by the council, it will receive £1000 per child less than the provision costs. Quite how this can be in the best interest of the unfortunate children counted over a school's notional number or applying to a new school is difficult to fathom. It also flies against the spirit and meaning of the SEN Code of Practice and law. The council has decided no additional money will be given to a school if it runs a budget surplus over the last three years (1). It won't agree to an EHC needs assessment on this basis. It would be beneficial for the local authority to clarify how a refusal to assess or provide an EHCP can be justified for a child whose needs are obviously above and beyond that which can normally be provided by a mainstream school even with a three year budget surplus. There is no provision in law to deny a child an EHCP on this basis, as far as we are aware. Since 2011 the Council has reduced the funding for most types of statements/EHCPs from £540 to £460 per annualised hour, a cut of 15% excluding inflation. In 2013 the Government set the funding threshold for statements at £6000 + AWPU, and said local authorities which were highly delegating, such as North Yorkshire, should delegate less (Operational guidance for providers - high needs reforms, 2013). This was not the legal test. The Council didn't want to do this because it didn't want to go back to writing more statements, so it negotiated with the DfE and set the level at £9200 +AWPU. The result is it is harder to get an EHCP in North Yorkshire than most other local authorities. In 2012 the council closed two special schools for children with behavioural, emotional and social difficulties (BESD), Netherside Hall and Baliol Schools. It amalgamated the staff and students in converted facilities on the site of a former naval base in Harrogate and named the new school Foremost. It cost £11M to convert and £2M per year to run. The school was dogged with problems from the start - see here, here, here and here. It has only ever been half full. As a result of the problems, the council had to place some children in independent schools instead. At the beginning of the year the council said it had given up on Foremost and announced its intention to effectively close the school and tender for a private provider to take over from October. Only one bid was received and this did not meet the quality threshold. The authority reluctantly announced its intention to keep running the school until an alternative solution can be found. The problems at Foremost have caused additional unplanned spending by the local authority. It is projecting a further ~£650k spend per year in order to fund independent places, with no end in sight. Quite rightly it is reluctant to move children once they are settled in a placement. The knock on effect on other children with SEN is not clear, but the result of the overspend has led the council to review (again) decision making for out of area placements, attempt to negotiate reduced fees to independent schools, and fund additional "legal support for decision making" (Appendix 4 of page 75 here). The council has spent over £50,000 on external legal advice since 2012 in a calculated move to make savings to the SEN budget by increasing its chances of winning at Tribunal. For any appeal involving an out of area placement or 'complex' (read expensive) case it will pay for legal representation, despite the Tribunal system being designed as an informal mechanism where legal representation is supposedly not needed. (See here).The council provided spurious reasoning for taking these steps, which were all refuted by the Ministry of Justice - see this post. Parents must bear the cost of legal representation at Tribunal themselves as Legal Aid is not available. The job of the Tribunal is to stand in the local authorities' shoes and follow the SEND Code of Practice and the law. It is not in the business of awarding gold-plated provision, only what is appropriate to meet need. This statement is as close to an admission that the provision in the county is not up to an acceptable standard as we are ever likely to see. The Council really doesn't like people knowing about the quality of the services it provides. It has been unwilling to disclose internal audits in the past and it refused to disclose an audit of its autism provision by the National Autistic Society. It was only when the Information Commissioner made a finding against the authority was it forced to publish. During the consultation period for its Children and Young People's Autism Strategy, the council claimed it had begun Personal Intervention Programmes (PIPs) for pre-school children - for those who were most in need of early, intensive help. It had committed to them in the strategy. Except that, in reality, no children received a PIP because that part of the policy was abandoned before it began. Instead, the Council introduced a record of intervention. It substituted a programme of intervention for a piece of paper. We will deal with the difficulties the new EHCP process causes to parents in another post. North Yorkshire's response to the Independent Commission on Freedom of Information has been published. This is the commission by which the government wants to restrict/reduce people's ability to question public authorities using The Freedom of Information Act. 2 It would like there to be a cost imposed on internal reviews of refused requests and submissions to the Information Commissioner's Office. I have complained to the ICO twice, one complaint was decided in my favour, requiring the Council to publish an independent review of autism provision in the County. In its finding the ICO stated that the Council had not considered the FOI correctly (both in its original refusal and in its review). 3 It would like to make it easier to refuse a request on the grounds that it would take too long by including things like redacting documents and considering exemptions when it calculates how long it would take to complete a request. North Yorkshire's autism strategy 2015-20 - Ignoring the evidence. North Yorkshire County Council is about to launch its new autism strategy for 2015-20, available here. It has been preparing the strategy for some time, with the usual consultation involving people with autism, families and parents, in conjunction with Health. I read the consultation draft, went to a meeting and put in a written response. I also have a child with autism, so I have some skin in the game. for ensuring a positive future with good outcomes for people with autism. We know that young people with SEN including those with autism do less well than their peers at school and college and are more likely to be out of education, training and employment at 18. In order to aspire high for people with autism we need to improve education and employment opportunities locally. OK. Education and employment are critical. Got it. A review has been was written (back in 2013). Yep. What does it say? Which interventions does the Council provide? Are any of these interventions behaviourally based? Any Applied Behaviour Analysis methods? Discrete Trial? Early Intensive Behavioural Interventions? Er, no. (Intensive intervention means intensive support to get excluded children, or children at risk of exclusion, back into their mainstream school.) Is the Council planning to use behaviourally-based interventions in the future? Er, no. Behavioural interventions don't make the list of educational priorities for the next five years. So the Council seems to be deliberately ignoring its own report that sets out the interventions with the most robust evidence, despite claiming to "promote evidence-based practice" and use a "scientist-practitioner model". Why? This is slippery behaviour. By referring to this report the Council is implying it is following its recommendations - what would be the point of including it if it wasn't - to give the impression of action. But then it doesn't follow it up. This leaves families with a second-rate service and children with poorer outcomes than would otherwise be the case. This was dropped in the final version. This was a flawed idea in that there would be no statistical significance in monitoring a small number of people over what is a relatively short period of time, but the Council appeared to accept the principle of directly measuring the outcomes of individuals, which is, of course, the best way to see whether the intervention works, and should be top of the monitoring list, done robustly year on year. Most of these things didn't make the final version. Some of them did make it, albeit altered, e.g. -dropping the pledge to reduce family breakdown and out of authority placements. What’s missing here? is attainment gap appropriate measure? Speech, indie living skills?Employer confidence?Define educational outcomes? Yes!Yes!Yes!Yes!Yes!YES! This is the really important stuff. How many people with autism can speak, how many gain independent living skills - stuff that families really value- is missing . Families have been asking the Council to measure these things for years to no avail. I know that for some families these aren't priorities. But for many families they are top of the list. 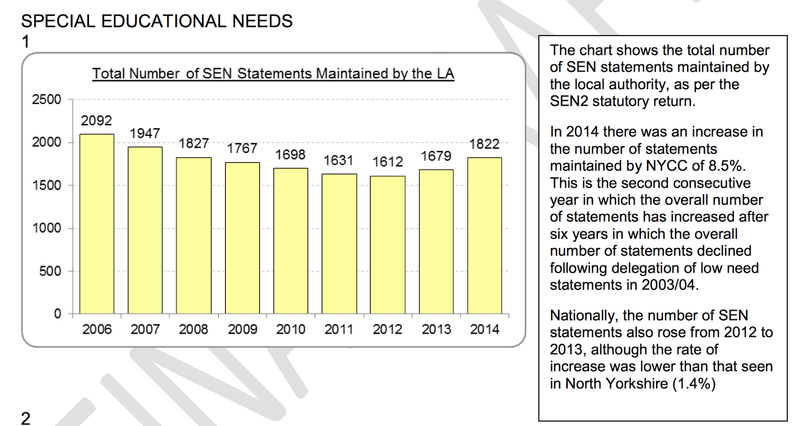 The SEN attainment gap is one of the worst in the country - again it doesn't get a mention in the final version. Perhaps it is too embarrassing. Instead we are left with a list of priorities which involve a lot of promoting, providing opportunities, and developing guidance. The pledge to increase the number of people in employment disappears. More soap and flannel. Should I wait for that before I pass judgement? Somehow, I'm not optimistic. The key things for me are not there. or have been removed. There is no commitment to use the most robust evidence-based interventions, and a poverty of ambition for what remains. Thank you, North Yorkshire, for the invitation to the launch event, but I won't be attending. Perhaps I should explain that although PECS is behaviourally based (it was invented jointly by a behavioural therapist and a speech and language therapist) I don't believe the Council is implementing proper PECS programmes. In the words of Pyramid, the company that runs PECS, "In order to really be able to teach others how to use PECS and its 6 phases, an individual must be a PECS Supervisor," As far as I am aware, none of the autism outreach service (ASCOSS) are qualified PECS Supervisors. March 2015 saw another substantial payment of £8000 to external SEND solicitors to defend Tribunals against parents. North Yorkshire's latest payment to solicitors specialising in special educational needs is available on the Open Data page of the council's website. The council must have its Local Offer published by 1 September. There has been a draft available for some months here. It should set out what services the council 'expects to be available' - not just those provided by the council , but by independent and private providers, within the county and close by. Many areas of the Offer are still missing data. It has recently added a description of its autism outreach services, which can be found here. From a report to the Children's Trust board, dated 11 June, available here. Includes total number of statements, new statements, number of high needs statements, sum allocated to schools for low and high needs, sum allocated to schools for high needs, percentage of statements issued within 26 weeks.